Guess what? 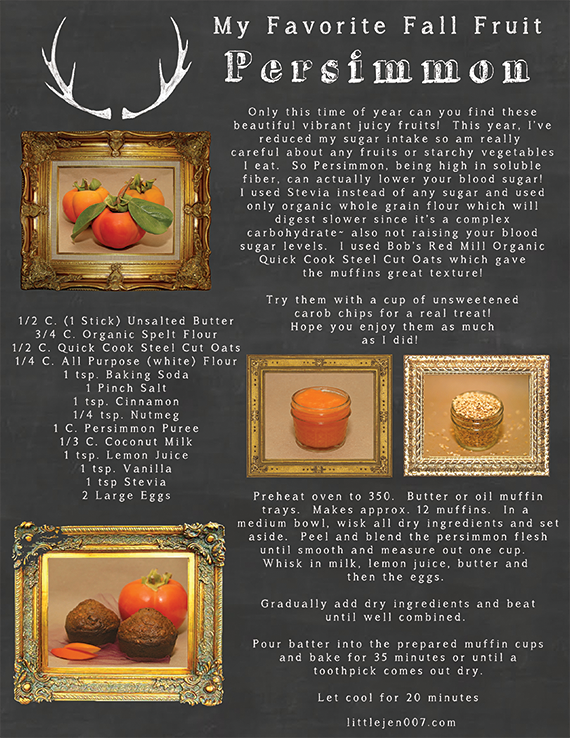 My beautiful, talented best friend Jen (who lives in the San Francisco area, which is way too far away from Chicago if you ask me) put together this gorgeous graphic for you guys with her recipe for healthy, delicious persimmon muffins. Jen fell in love with persimmons this year and has been whipping up all sorts of fall and winter recipes featuring them. The best part is that if you click here or on the image above, you can download the high resolution file and print it out. I currently have it hanging in my kitchen with my other art pieces. It would also make a fun gift for foodie friends! Thank you Jen for putting this together for Bubby and Bean's readers! If any of you live in the Seattle area (where Jen spent ten years before she relocated to California this past summer), you're probably familiar with the work she did for the Seattle artists scene, most specifically the Pioneer Square arts community. You can view some of her design and photography portfolio here. Do we have any other persimmon fans in the house? Do you have any good persimmon recipes you can recommend? P.S. I'm extra thankful that I had Jen to fill in today, as I spent yesterday in the hospital being monitored because I'm having some complications with the end of my pregnancy. I'm home for the time being on strict bed rest but hope to update the blog as best as I can. Craziness! For those who are interested, there are more details over on my Instagram. I love Persimmons! They are yummy and healthy:) Your friend did a great job, the recipe card is lovely, thanks for sharing:) And you take care and rest! I hopped on over to Instagram and left you a couple of messages. I hope you're doing well now. Tell that baby girl to hang in for just a few more weeks. She can do it! I had two preemies, though, and I know being rushed to the hospital a little early is a really scary thing. Rest well, my friend. Take care. My thoughts are with you. These look soooo yummy and the printable is beautiful, thank you!!!! How scary about your hospital visit and bed rest, keeping you in my prayers!!! oh no! I hope you're doing better - and take it easy! What a beautiful graphic and a delicious looking recipe! I'm excited to print this out and try them. I hope you are feeling better and that everything is ok. I'll be keeping you and the baby in my prayers! Oh Melissa, sending positive thoughts your way. Be sure to stick to the bed rest and take it easy! Thanks for the sharing recipe - I haven't baked with persimmons yet! Looks delicious! Oh yikes, hope everything is ok with you and the pregnancy! Wishing you and the little one all the best. On another note, I'm very excited about this recipe. My mother in law LOVES persimmons, I'm going to send her this recipe!